Application: design, manufacturing, installation and service for machines for electronic industries: for material deposition, lasers, ovens and related automation systems. 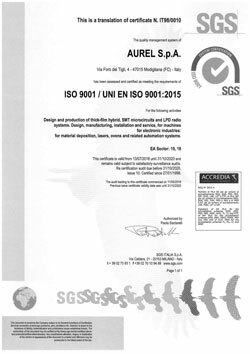 ISO 9001 is the internationally recognized standard for business quality management, encompassing all of the processes that organizations use to create and control the products and services that they provide. ISO 9001 prescribes systematic control processes for all of the activities that companies use to ensure that customer expectations are met, and applies to virtually all products and services produced and delivered through any process anywhere in the world.